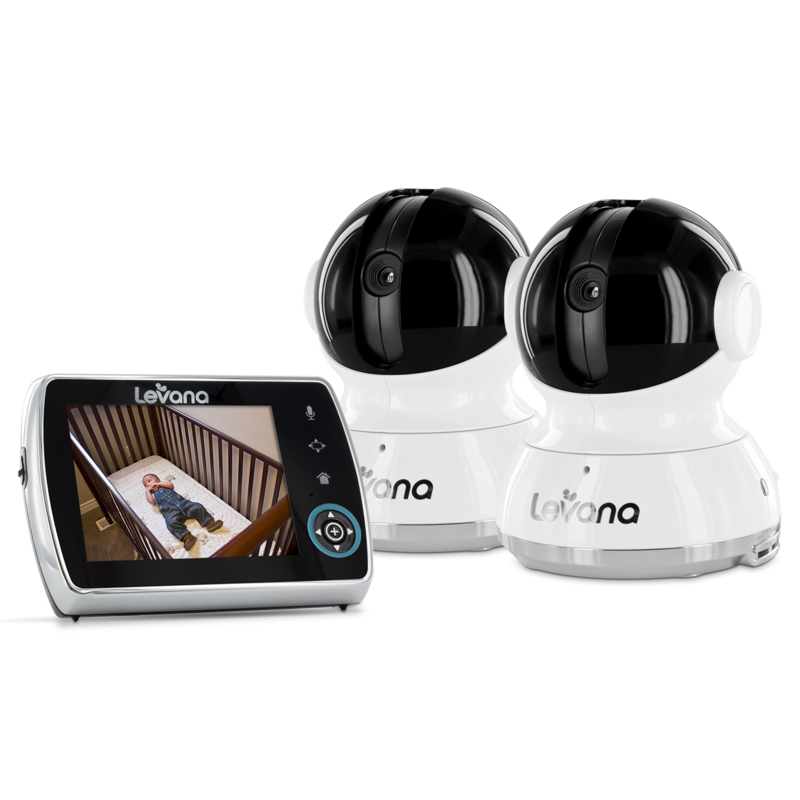 Introducing Keera, Levana’s 3.5” touch panel Pan/Tilt/Zoom video baby monitor. The Keera monitor includes the ability to record video and take pictures of your little one while viewing the live performance from your monitor. A powerful battery will last up to 10 hours while you and baby catch up on your extra winks. Touch panel buttons and simple graphic icons make selecting any of the many features easy and intuitive, even if you are distracted. Trust the Keera monitor to shed some light on the freedom of doing more knowing your child is safe. When you find yourself multitasking you won’t need to stop and recharge this monitor for up to 10 hours. Adjustable PEEP (Power-on/off Energy Efficient Picture) sets your monitor and your camera to “sleep” when there is no sound in the nursery saving hours of valuable battery life. The second your baby makes a “peep”, the camera and the monitor will activate so you can see and hear exactly what is going on. Remember when your mother told you she had “eyes in the back of her head”? Now you can increase your own parental superpowers with a pan/tilt/zoom camera. Using the monitor from anywhere in your home you can adjust the camera view horizontally 300° and tilt vertically 110°. That’s more range than a human head and neck! And when you find what you are looking for you can zoom in to verify that what you are seeing in even greater detail. See when your beloved cat is approaching your little one’s crib, check if the window was left open in the nursery or find your older child before they color on the wall! This smooth, silent adjustable camera gives you powers that are out of this world and will be a handy secret weapon as your little one becomes even more mobile and curious. Calm your baby with the sound of your own voice with two-way Talk to Baby™ intercom. Parents love this feature for communicating to each other when they need some help in the nursery. Babies love this feature because they know when you are coming to the rescue. ClearVu® technology provides you the outstanding precision and clarity of a digital signal from up to 750ft away. The Keera monitor has a private, secure and interference-free digital signal that no one but you can access. Feel free to accomplish tasks inside and outside of your home, all the while knowing baby is safe and sound. Sound indicator ring changes color with the sound of your baby’s voice alerting you if she is crying out when you have the volume turned down and features adjustable sensitivity. The Keera monitor’s expandable system grows with your family; add up to three additional cameras to conveniently view up to four areas of your home on one monitor. Does your baby love the sound of lullabies before bed and cry out for more when the music stops? The Keera monitor has three lullabies that can be remotely activated and changed by your parent unit. Battery life of 10 hours based on 10 audio activations while in power save (PEEP) mode. Battery lasts an average of 6 hours with continuous audio/video usage.